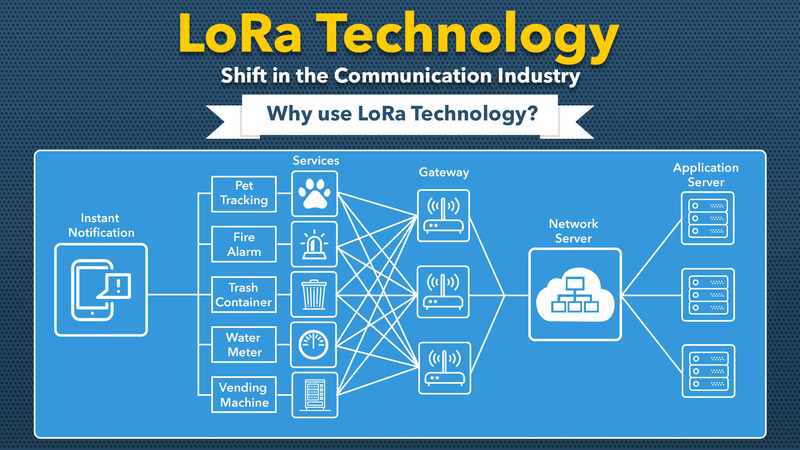 Why Should Telecom Companies Implement LoRa Technology? Devices working in a LoRa network do not operate at higher than 10-25 mW (in compliance with ISM frequency usage regulations). That, in turn, economizes on total data consumption levels and enhances the battery life of the devices to 9-10 years, on average. This figure is significantly higher than the battery performance of both LTE Cat-M (<2 years) and Narrowband (<8 years) devices. By nature, LoRa uses ‘low power’, and hence its battery performance is higher than that of its rivals. The Adaptive Data Rates (ADR) of LoRa networks offer a much-needed flexibility to telecom companies which opt for it. In accordance to the ‘LoRaWAN R1.0 Open standard for the IoT’ (2015), this LPWAN protocol works in a data range of 0.3Kbps to 50Kbps. The ADR is managed by the network server, with the help of specific algorithms (for individual devices). As a result, the overall network capacity is optimally utilized, LoRa implementation becomes that much easier and efficient, and device batteries get a further boost. One of the biggest advantages of LoRa technology is its seamless usability in all types of environments (urban and rural). In fact, in rural/semi-urban areas, the coverage of LoRa network shoots up 15-18 kilometers – while in urban locations (e.g., cities) too, the coverage is upwards of 10 kilometers. As a result, only a few LoRa base stations need to be set up, to cover entire cities (for the creation of ‘smart cities’). For instance, nearly the whole of Belgium (nine-tenths) is covered by 360 base stations, around 250 base stations cover the entire of Switzerland, and for Netherlands, 500 base stations are enough. LPWAN in general, and the LoRaWAN standard in particular delivers a niche service – something that cannot be provided by most of its rivals. Wireless technologies like Zigbee, Bluetooth and Wifi are typically functional over a low-range, and can only be used for applications that require low coverage. On the other hand, cellular technologies (like NB-IoT) are more powerful and offer faster data transfers – but are significantly more expensive than LoRa. The cost difference becomes all the more prominent when the need to upgrade these cellular technologies is taken into consideration. For low-power, long-range IoT networks, LoRa is the most viable. Note: Implementation of NB-IoT is limited to locations where 4G/LTE base stations can be set up. The total number of base stations is also 7 to 10 times more (for the same coverage area) than in a LoRa network infrastructure. Implementation of the LoRa network protocol requires the presence of advanced LoRa gateways and concentrators. While at first these might seem to be an additional expense (NB-IoT, for example, does not need gateways) – the gateways are very competitively priced. In addition, the cost of the radio chipsets is less than $2, while the telecom players have to spend no more than $1 (for each device) for the annual subscription. There are no hefty upfront investments required – and that mitigates the overall business risk factor considerably. LoRa operates on a low bandwidth and via unlicensed frequency bands (915 MHz (US), 868 MHz (Europe)). As a result, the technology is ideally suited for IoT use cases that involve low/very low data transmissions and probable fluctuations in the data. To put it in another way, the low bandwidth requirement of LoRa technology makes it the perfect fit for IoT devices that only have to ‘deliver information’ (e.g., is a parking space full?) to end-users. Since unlicensed frequency spectrums are used, there are no fees or license charges involved either. Instead of the traditional mesh architecture, a LoRa setup follows the ‘star-of-stars topology’ – for easier setup and deployment by telecom providers. The network architecture leaves little room for possible errors, and implementation is far from being costly. What’s more – thousands (literally!) of nodes/devices can be connected with a single gateway, lowering management-related pressures. The ‘Chirp Spread Spectrum’ (CSS) is used in the physical layer of the LoRa infrastructure. It is also possible to keep the radio-frequency (RF) link budget constant, while bringing down the transmitter power – to gain more battery performance. Both LoRa and Sigfox are open standards – but the former offers greater advantages and better applicability to IoT solution providers. For starters, the bandwidth range of LoRa is higher than that of Sigfox, while the number of transferrable messages is also significantly more. Unlike Sigfox (which is maintained by a single private organization), the LoRa framework is maintained by the 400-member strong ‘LoRa Alliance’ – which makes backend modifications (as and when required) easier and more prompt. The LoRa ecosystem is also stronger and is ideal for open innovation. The network IP can be licensed out to third-party vendors. Being an open IoT standard, LoRa also supports smooth interaction across applications, and can be deployed faster as well. To be classified as a ‘good wireless IoT standard’, a solution needs to be scalable – and LoRaWAN scores big on this count. Depending on the precise requirements of the final applications, the coverage/range of LoRa devices can be varied from 2-3 kilometers to 12-15 kilometers. A classic example of this variability would be the Micro Cell and Macro Cell gateways (available commercially). The network also ensures 100% data integrity and security with the help of the cutting-edge AES-128 encryption standard. The service from the LoRa end-nodes is somewhat like that from Virtual Private Networks (VPNs) – with all data passing through between app servers and network nodes being encrypted. The top-notch security, reliability and scalability of LoRa technology helps it emerge as a great tool for telecom players. In comparison with Bluetooth or Wifi, the performance of LoRa networks is a lot less affected by interferences. This advantage is brought about by the fact that LoRa operates in unlicensed sub-gigahertz frequency spectrums – and at these levels, very little power is required to ensure the smooth passage of data through different types of obstacles (Wifi, on the other hand, functions in the 2.4 GHz range). The chips and sensors used in a LoRaWAN architecture also offer greater adaptability and optimized data-exchanges – thanks to the spread-spectrum method it utilizes. Note: In sleep mode, the LoRa end nodes consume as little as 200 nA power. The receiver uses 10 mA. Different IoT applications have different functionalities, and hence, require varying capabilities. To ensure compatibility with practically all types of end-applications, the LoRa modules supports bi-directional communication (Sigfox also offers this, but the link budget is significantly lesser). On the basis of the type of communication(s) supported, LoRa devices are classified under 3 heads: a) Class A devices, which follow the ALOHA protocol, and have 2 small downlink windows after every uplink transmission, b) Class B devices, which receive in-sync beacons from LoRa gateways for opening additional ‘receive windows’, and c) Class C devices, which keep the ‘receive windows’ open, except when transmissions are going on. Belgium, Netherlands, South Korea, Australia, Netherlands, China, India – telecom players from various countries have started to implement the LoRa technology (open LoRa implementations). The reason for going with this LPWAN tool is fairly straightforward – LoRa can be used to create a vast range of IoT applications, right from smart parking slots, public lights and waste management tools, to connected car support, home automation, water and pollution meters, predictive maintenance sensors, and even city drones. For end-to-end coverage of a cities (for high-range, low-power, infrequent data transmissions), LoRa is the best solution. In early-February this year, Actility joined hands with Inmarsat to create the world’s very first global LoRaWAN network. The application of LoRa in private networks is also increasing – with many companies using the technology to establish ‘smart workspaces’. The protocol can be integrated with 5G-supported base stations as well, ensuring future viability. The LPWAN market has moved on from its infancy stage and is well into its ‘early maturity’ phase. There are plenty of scopes for telecom companies to move on to the LoRa platform and expand their businesses – the technology has way too many advantages to be ignored.